This may seem like a very labour intensive and long winded recipe with lots of steps but if you break the steps down into manageable portions this recipe will be very simple and easy to whip up. You can make the spiced pear cake the night before, wrapping it in clingfilm to keep it moist. You can even make the brown butter and salted caramel the day before if you want to make things super quick. The trick to a long recipe is to get organised and prioritise. If your doing the recipe all in one go start with the spiced pear cake, get them in the oven and move onto the brown butter, you need to let it re solidify before you can use it, once it has browned pop it into the fridge to cool. 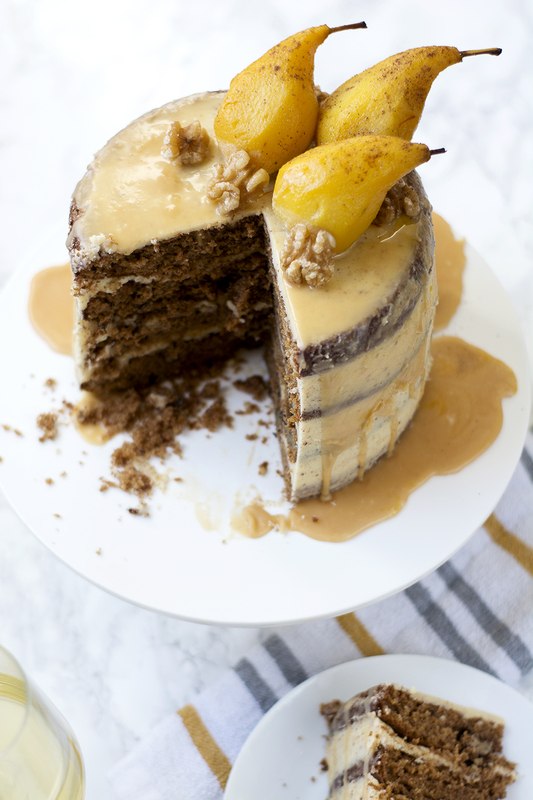 Once the brown butter is cooling, move onto the caramel, let that cool in the fridge whilst you peel and poach the pears, pop the pears in the fridge when done. Once the caramel and the pears are done the cakes should be out of the oven and cooling. Then you can move onto the buttercream. If the cakes haven’t cooled by the time your buttercream is done, pop your feet up for a cuppa whilst everything is cool and assemble just before you serve. See if you you use the time wisely it will take no time at all! Pre-heat your oven to 180C, line your cake pans with baking paper and spray with non stick cooking spray. For your reference I use shallow 7″ cake pans. In a large mixing bowl sieve the flour and add the spices, bicarbonate of soda, baking powder and salt. Stir together and leave to one side for later. In another mixing bowl, whisk together both sugars, eggs, vanilla, oil and buttermilk until the mixture is smooth and lump free. Using a hand greater, great the pears into a small bowl. 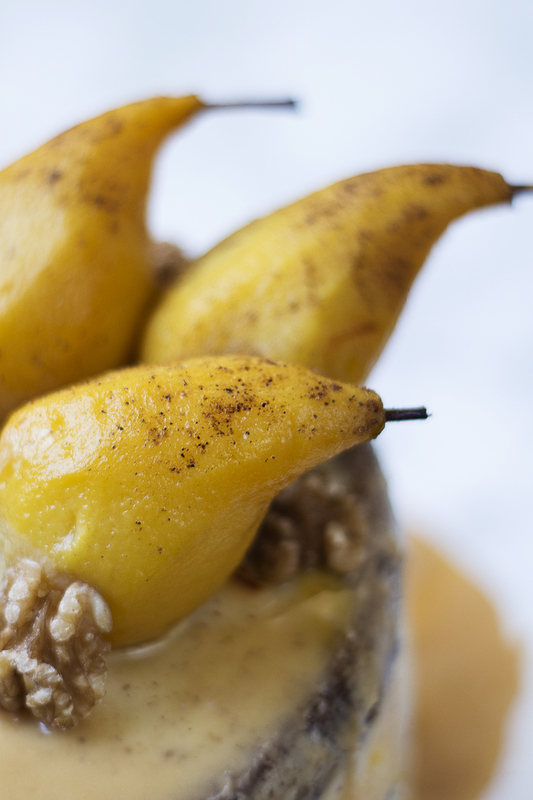 Use your hands to squeeze any excess moisture out of the pears before adding them to the wet mixture. Stir well to combine. Add the flour mixture to the wet ingredients and stir everything well one last time. There should be no lumps and no dry ingredients stuck to the bottom of the bowl. Add your walnuts and stir them through. Divide your mixture evenly between 4 7″ shallow cake pans. If, like me you only have two then bake the cakes in two batches. Bake the cakes for 25-30 min or until golden. You will know they are ready when you insert a clean skewer into the centre, it comes out clean. Leave the cakes to cool completely on a wire cooling rack. Melt butter in a medium pan over medium heat, cook the butter until it turns a golden brown colour, stir occasionally to prevent burning. When the butter has turned brown, pour into a large, heatproof mixing bowl and set to one side to re solidify. If your kitchen is warm, it may help to pop it into the fridge for an hour. Once it is solid again, take it out of the fridge and let it come to room temperature. Transfer the butter to a large mixing bowl and beat with an electric whisk for 2-3 minutes until creamy. Sieve your icing sugar and gradually add into the bowl with the butter. Keeping your whisk on a low speed to prevent an icing explosion. When all of the sugar has been incorporated add the vanilla, cream and salt and beat again at a higher speed for another few minutes until you have a light and fluffy texture. Pop the mixture to one side until ready to ice the cake. In a medium saucepan, on a high heat, bring the water and sugar to a boil. Do not stir the mixture, just swirl the pan if it looks like it will stick. Cook until all the sugar has dissolved. Keep cooking, no stirring just swirling the pan occasionally until the caramel starts to form. This can take up to 7 or 8 minutes. The liquid will turn from clear to a lovely golden amber colour. Remove the caramel from the heat and stir in the cream and salt, stir until the mixture is smooth. The mixture will froth up somewhat at this point, keep stirring really well, if you have used a small pan, best to do this over the sink just in case, I’ve had some caramel disasters at this point using a small pan and too much caramel. Add the butter and vanilla and stir again until everything has combined. Leave the mixture to one side to cool. Bring the cider, water and star anise to the boil in a large saucepan. Add the peeled pears and turn down the heat to low. Let the pears simmer for 20-25 minutes until soft and tender but not mushy. Leave to cool until ready to decorate. 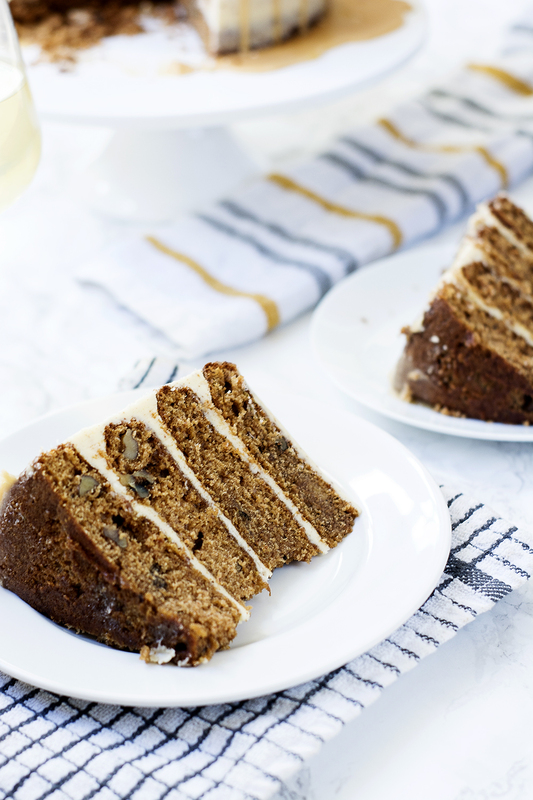 Start with one layer of the cake on a cake board or a cake stand. 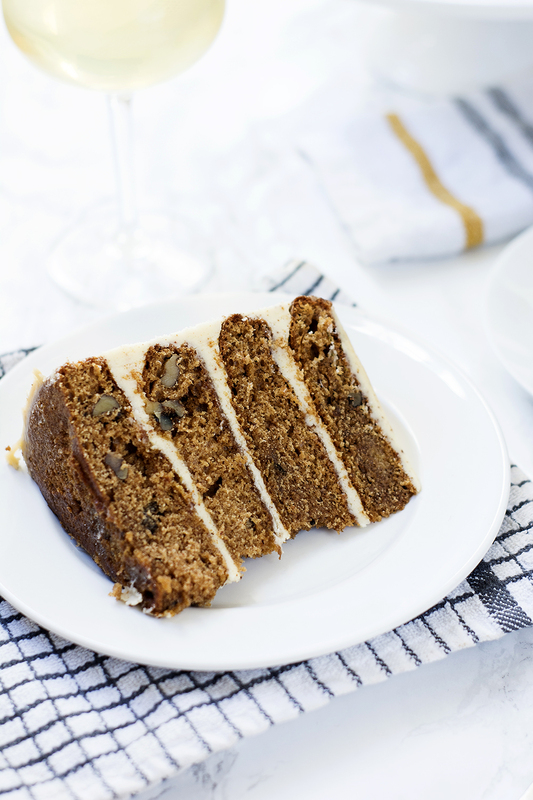 Using a small spatula spread an even layer or buttercream over the cake, about 1cm thick. Place another layer of cake on top and spread another even layer of buttercream. Using your leftover buttercream, apply a layer of buttercream to the top and sides of the cake, you may find a cake scraper to be more helpful for this. Roughly apply a layer of buttercream to the outside and place the cake scraper vertically onto the side of the cake and in smooth motions scrape it around the cake. Level out the top using the cake scraper by spreading a layer of buttercream along the top of the cake and scraping from one side to the other. If your scraper is small you can place it in the centre and rotate it 360 degrees to achieve a smooth top. Place the cake in the fridge for 20-30 minutes just to harden up the buttercream. Drip the cool caramel over the sides of the cake. You can pour it for more of a waterfall effect or carefully drip individual drips, its up to you. 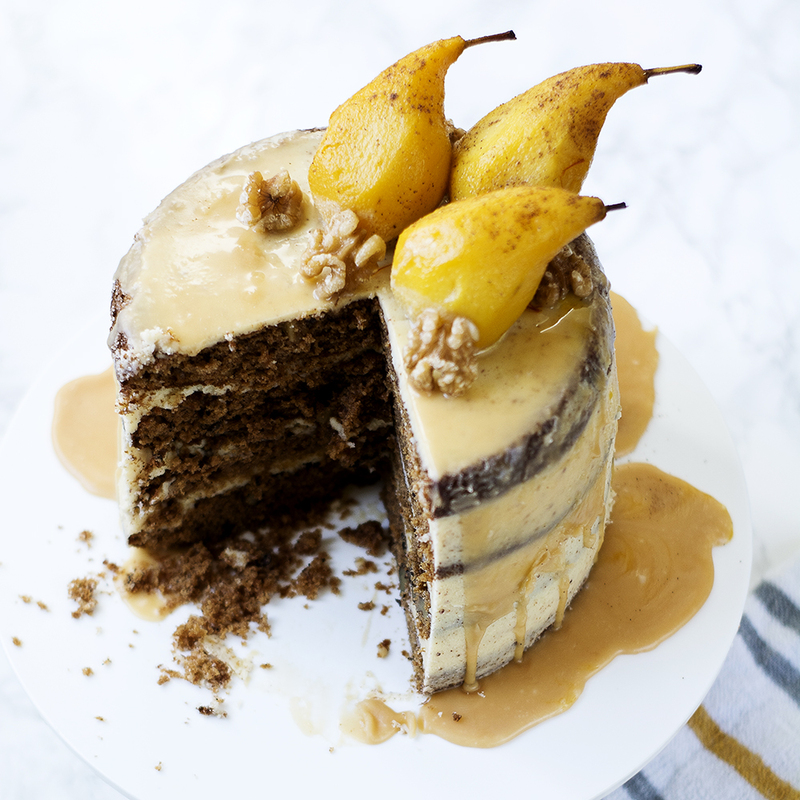 Place your pears in a trio either in the centre or offset to one side on the top of the cake and serve. Oh wow! That was a long one, thanks for sticking with it I promise it will be worth it! There you have it my spiced pear cake with brown butter buttercream. If you give this recipe a go let me know how it goes by tagging @whatseatingmanchester in your social media post! What a wonderful looking and sounding cake! YUM!! Oh yummy!! This is such a gorgeous cake and I love the idea of the brown butter buttercream. Some really prize articles on this internet site, saved to my bookmarks.